The historic Benton Hot Springs Campground in Benton, California, is in an unusual high desert location with natural mineral spring water. Each campsite offers a private hot tub to soak in with views of the White Mountains. At sunset, and when the stars come out, you have a ringside seat of the night sky with no ambient light to diminish the view. The remote location away from civilization is a perfect escape for nature lovers. 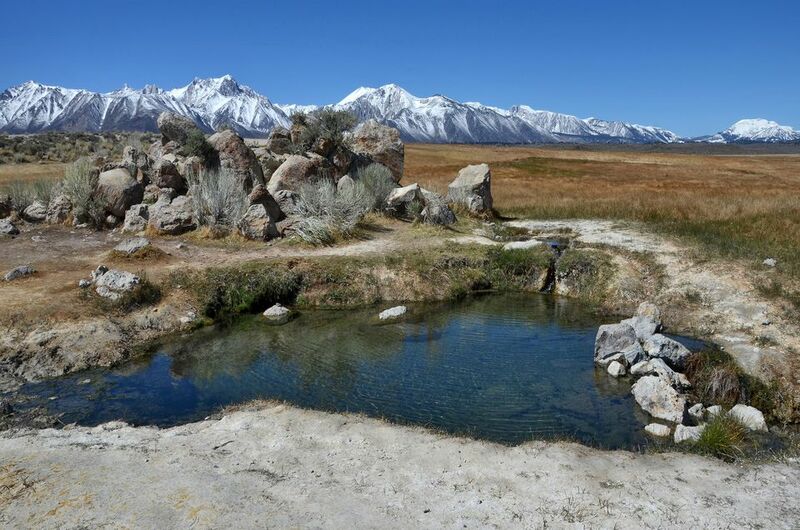 Benton Hot Springs is well off the beaten path, about 45 minutes from Bishop or Mammoth Lakes in California. The campground is located on Highway 120 near the junction of Highway 6. It's a little more than 300 miles northeast of Los Angeles, near the Nevada border, and about 365 miles east of San Francisco. Private hot tubs at each campsite make this campground one of a kind. The hot mineral water is soothing and relaxing. There are just 11 campsites, and each is fairly private. The views of the White Mountains are spectacular at sunset and sunrise, and each hot tub has a fantastic vantage point. Campsite numbers 1, 2, 3, and 11 have a one-to-three person redwood hot tub that sits above ground. Campsite numbers 4 through 10 are larger sites, and the tubs can accommodate four to eight people. Trees separate the bathing areas, so clothing is optional, although the owners mention that "discretion is encouraged." Tubs can be reserved for an hourly rate if there is availability. Pets are allowed, but are required to be on a leash or kept at your camping site. There are fire pits, barbecue grills, and picnic tables and chairs at each site. The larger sites fit multiple cars and RVs with no hookups. Generators are permitted from 8 a.m. to 10 a.m. and 5 p.m. and 7 p.m. only. Reserve a campsite before arriving since the area is small and can easily be full. If it is a quiet time of year, staff members are only available during the middle of the day and not available at all some days of the week. For the non-camper, guest rooms are available at the Old House and Inn at Benton Hot Springs, which is bed-and-breakfast inn; breakfast is only available to paying inn guests. The Inn also has separate hot tubs for paying guests. Rates are charged per hour or overnight and depend on the number of people in your group and whether it is a small or large-tub campsite. Second and additional days are at the same rates as the first day. Early check-in or day use costs extra. Children under 12 are free with a paying adult. Check the Benton Hot Springs website for the most current pricing options. Winter can be cold at Benton, but the hot springs stay hot year-round. Spring and summer months can be hot and buggy, while the fall has typically mild weather. Benton is one of the oldest towns in the region having been founded by Native people who came to make use of its hot springs around 1852. Silver ore was discovered in the mountains of Benton in 1862, and the area rapidly expanded. In 1883, the Carson and Colorado Railroad built a stop four miles away from Benton, making the city a hub for travelers heading west. While Benton did not continue to grow further in the following years, it remains a destination for tourists seeking a respite from modern life.